We walk for at least a block together, and it occurs to me that although he had been sounding off even before he joined me on my side, someone had nearly driven over us as we stepped into the crosswalk and his vitriol might have something to do with that. Then halfway down the block, a woman drives out of a parking garage and halts on the sidewalk in front of us, blocking our forward progress. I’m slightly miffed, but my miffage is almost immediately assuaged by the fact that there is already a running, verbal complaint audible in my left ear. It occurs to me that the man might well be channeling my own sense of pedestrian entitlement, as though his body and vocal cords were a receiver and amplifier of my own indignation. I could protest that I was simply an innocent bystander, that I just happened to be walking at the same pace slightly in front and to the right of a crazy person, but the fact was, many of the phrases I was hearing seemed to be from thought patterns that I would have to admit to having entertained in my own head, and pretty recently, too. I get tired of nearly being struck by motorists, and it happens a lot. Was the man just picking up and broadcasting my own signal? The fact that he was walking behind me and I couldn’t see him heightened the sensation that I was hearing a voice in my own head. The scary part is, the voice just didn’t seem that foreign. What a horror it would be if my most self-pitying, resentful and uncharitable thoughts were suddenly bullhorned to the world around me via some inductive crosstalk between my own magnetic field and that of someone with a looser tongue. And what if I couldn’t shake that person by turning right down Cherry? What if that person remained at your left heel always, like some figure out of early twentieth-century German literature. The whole episode made me want to think kinder thoughts. Note: This is the second part of a tour in three parts. Part I is here and Part III is here. I hope you’re rested up, because our survey of the fountains and cascades and other water features in the downtown area continues. I keep finding more, and it has also occurred to me that there are plenty of indoor fountains and dribblers as well (though for the life of me I can’t think of a single one at the moment). So I’m going to make this a three-parter and I’ve decided to limit this tour — all three parts of it — to outside installations in the area bounded on the east by the freeway (sort of, as you’ll eventually see), on the west by the waterfront (obviously), on the south by Main Street in the Pioneer Square neighborhood, and on the north by about Pine or Stewart or so, even though I already included an installation as far north as Broad Street in Part I, and even though I have a bonus fountain outside the prescribed area for those of you who make it to the end. Well, let’s get started. This time we’ll explore the area south of Seneca Street and east of Fourth Avenue. Everyone got their walking shoes on? It takes a pretty sunny day to get this river flowing. Alas, not today. Double dog dare. Wo, time to find Eddie Shoe Shine. City Hall, bounded by James and Cherry streets and Fourth and Fifth avenues, represents the first of two places on this list that I’ve been kicked out of. (Because, grasshopper, I had a camera and that’s what happens when fear and power meet in the same hand.) The current City Hall replaced the one built in 1962, the year I was born. That one had a fountain, too, up t’ Fifth Avenue side, but it seems that that mod building was no longer much beloved at the turn of the century, so in 2003 it was eliminated — fountain and all — and a new City Hall was built. The new one has two fountains, both very impressive when they’re running. They weren’t running the day I walked over there, but on sunny warm days (har!) jets of water squirt three or four feet straight up out of holes in the pavement to delight kids and other visitors who might care to stroll or gambol among them. And a wee brook tumbles down its own narrow set of stairs parallel to the people stairs that ascend to the main entrance. Rating this one will be problematic: sitting on the City Hall stairs would allow you to hear this cascade but not see it, and you’d look like a troublemaker, a sit-in-er. But there are benches near the squirty holes. Sound quality: If memory serves, both waterfall and squirty holes are auditory winners. Plus, the sounds of children playing in water are always a delight to this reviewer. Not as lonely as it looks: the stressed out City employees are enjoying a smoke-break in a corner to the left. 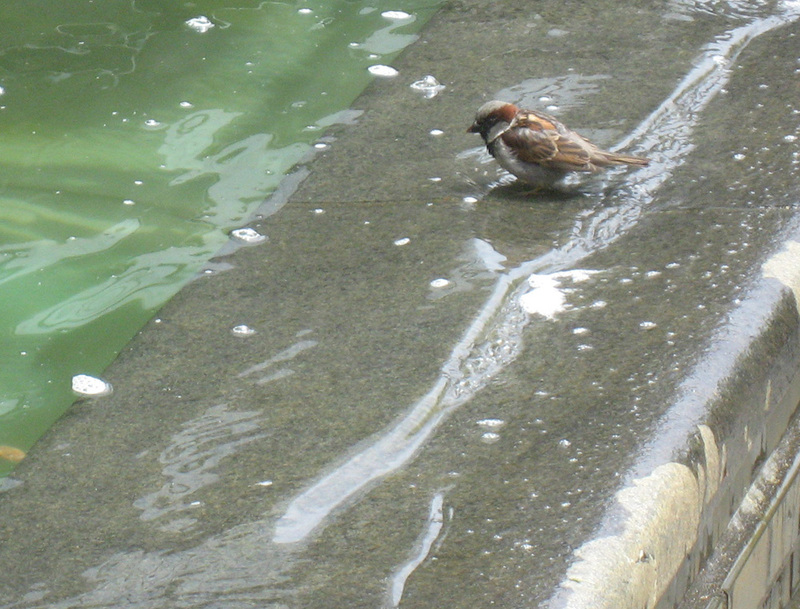 This little sparrow (?) came for a municipal dip. Directly behind City Hall is the Municipal Court, which has a square pool in one corner that in theory spills over a low edge at the sidewalk. When I was there two days in a row it didn’t seem to be quite full so it wasn’t spilling over. And there is no “fount” per se; like many water features these days it was bubbling like a cauldron, filled from below the surface like a jacuzzi. Consequently there wasn’t that sheeny sound, just this glurping and glopping. It cascades and it rankles. You’ll recall that I got hustled out of the courtyard in which the diminutive urban canal here tumbling over a double falls finds its headwaters. No problem, mister Man…I shot this from the PUBLIC SIDEWALK!!! Obviously it still rankles. All the cascading is here at the sidewalk. Up in the plaza it’s just a little canal you step over, so there isn’t really much of a sit-and-listen draw here. But they don’t really want us here anyway. Let’s move on. The Fountain of Wisdom in its new setting. 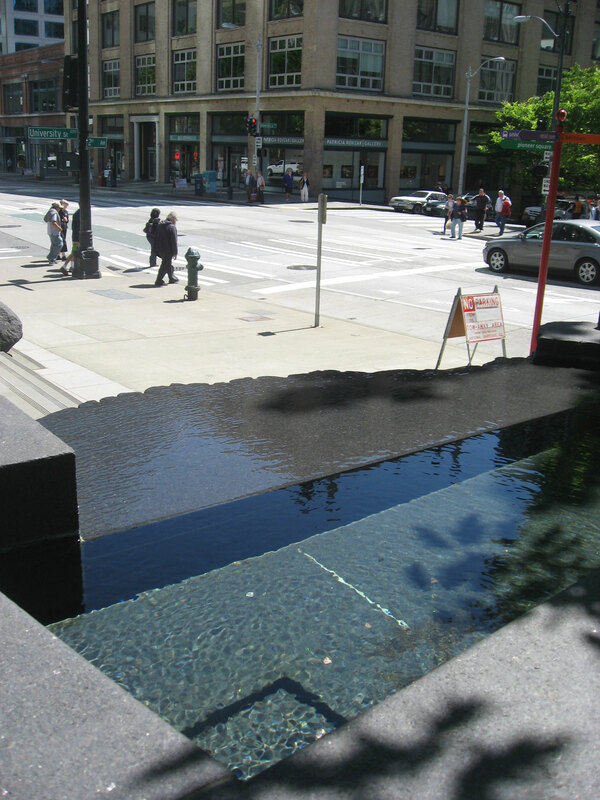 I knew there was a fountain in front of the Seattle Public Library’s downtown location, but I hadn’t really regarded it, you know…looked at it with my focus. When I went round there with the old point-n-shoot, I had a funny feeling that this fountain with its ’60s curves and geometry had not been created new when the new library was built in the first decade of this century. It just doesn’t seem in keeping with the new structure at all. And indeed, a little peeping on the Internet reveals that this is the sculpture that George Tsutakawa created for the 1961 incarnation of the library. You can’t expect librarians to throw anything away. I’m glad they didn’t. It’s really the only decent fountain from Cherry to University from First up to Sixth, unless I’ve missed one. It’s called “Fountain of Wisdom”, and I’m sure it had a whole different feel when it was not towered over by its host. 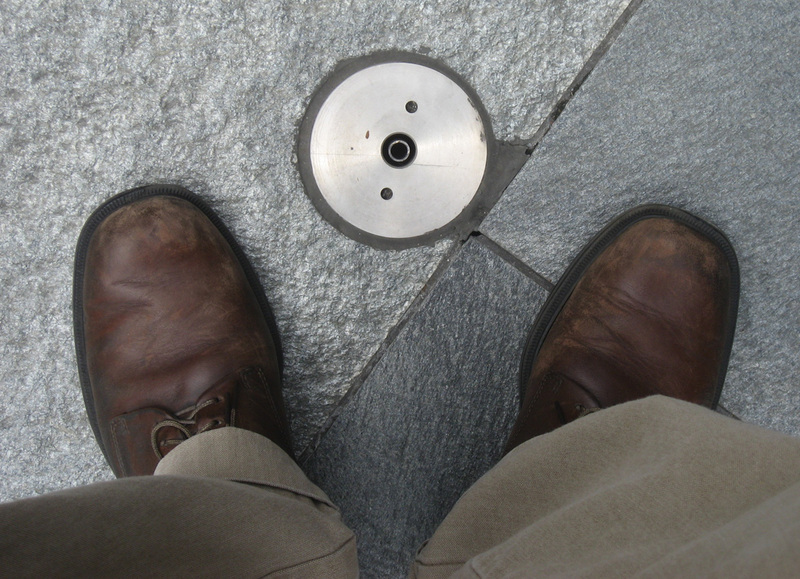 If memory serves it used to be located in a courtyard on the library block’s opposite corner, up at Fifth and Spring. I took several other photos showing it dwarfed by the angular facade of the library, but I chose this one that, to me, allows it to hold on to its dignity. Treat yourself to walk on the edge, and rest here. The locals don't bite, but they smoke and they mumble. If they had waited a year, they could have asked me and even as a mewling, puking infant I would have been able to convey to the Deciders that cutting our downtown in half with a freeway — as an idea — was doubleplusungood. 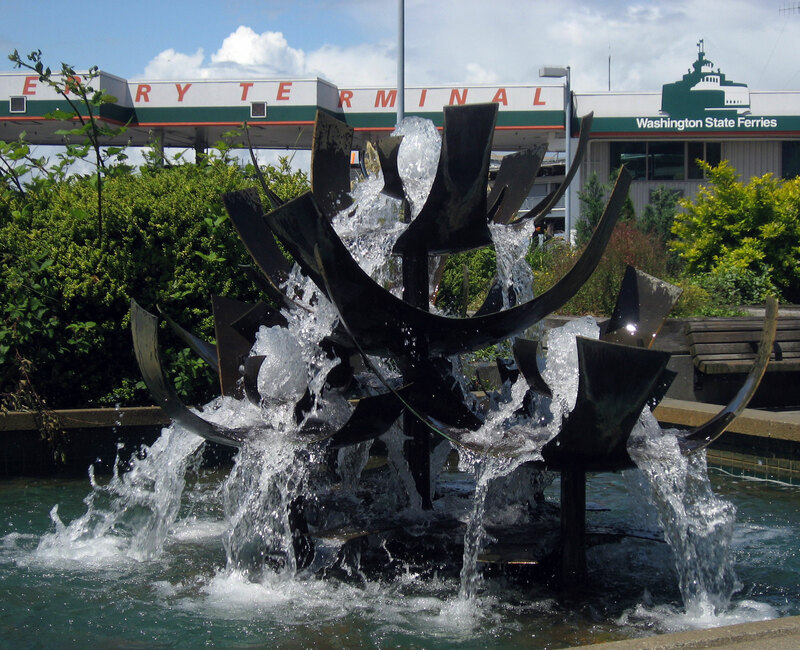 But there are several silver linings on the cloud of I-5 through Seattle, and one of them is that it was deemed expedient to soften the blow of this indign swath by erecting a fountain at its edge, which is why we now have the Naramore fountain. In the last week I’ve gotten to know the handiwork of George Tsutakawa to say hello to (partly because Paul Dorpat has always preceded me to these places and written them up — as in his Now & Then article here). This is another one of George’s creations, and this time we get to see a GeoTsu fountain right where he put it. 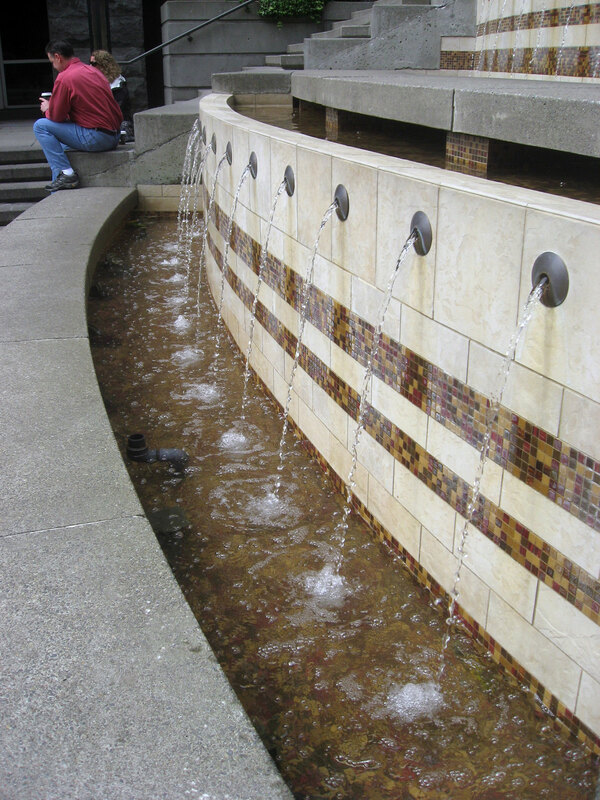 The Naramore fountain, named after the man who commissioned the work, has a number of what I might call petals at different heights and of various widths, and a broad runoff surface with another low edge, so the water’s sound is very expressive while not being deafening. Shape- and soundwise, it’s my favorite of the three Tsutakawa’s I’ve encountered. 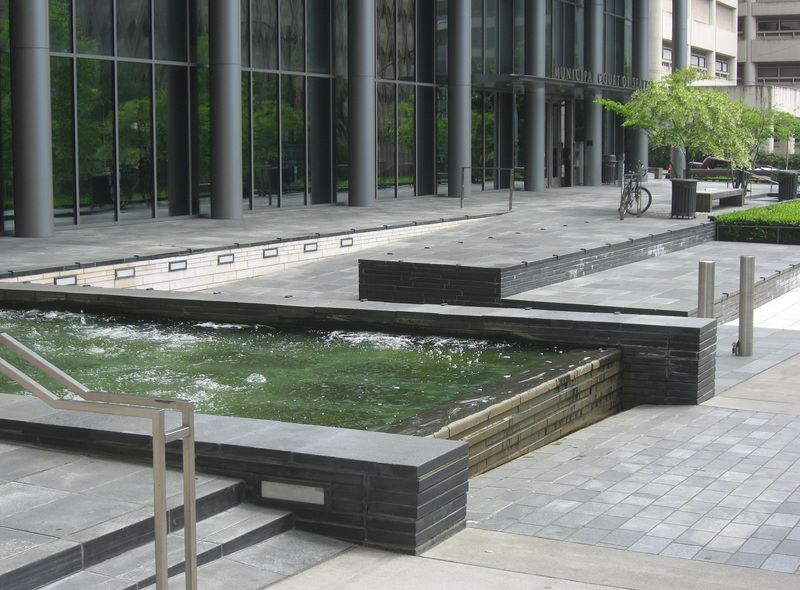 The downside is that it’s located in the curve of an off-ramp — by intention, sure, but you get the impression that GT’s fountains were appreciated more as workhorses in the service of softening the harsh edges of the cityscape than as foci of contemplation and reflection in themselves. Oh well, he made something like 70 fountains around here before passing away in 1997, so maybe someday I’ll come across an organic, multilevel fountain in the middle of some quiet park or garden and recognize it as a GT. As for this one, I’ve walked within a block of this fountain several, maybe many, times lately, and hadn’t even noticed it. It’s on the freeway side of the street, which means you’re not likely to be walking past it unless you’re going to visit it. Please do so now. Note: This ended up being in three parts. Part II is here and Part III is here. There are a number of ways to be near water in Seattle. Until this week it was starting to seem that all you had to do was walk outside and let it fall on you. But even when the rainclouds mosey on over the mountains and the sun comes out again, there is still plenty of water about. Lakes and waterways abound, and last time I looked (which was at lunch) the Puget Sound was out there, a vast inland saltwater sea that those with wide anthropological perspective and those given to causing trouble call the Salish Sea. Water actually gets in our way and, when bridges fail, it imperils our collective bustling around from here to there. And our bridges do fail — the floating ones float away and sink in storms (Hood Canal, 1979; Lacey V. Murrow, 1990), the high and gracefully arched ones fall into the deep channels that separate the twisting islands and peninsulae of the Sound (Tacoma Narrows, a.k.a. “Galloping Gertie”, 1940) and the drawbridges get stuck open when ships crash into them (Spokane Street Bridge No. 1, 1978, and what a sorry tale THAT turned out to be). Hey, we’re a port city. Water water everywhere, sure. But there’s a different water experience that some of us seek out, and that’s the babble, chortle and roar of water splashing around in fountains and other man-made cascades solely for our serenity and refreshment. Water not on its way somewhere, water just circling. I’ve been collecting these “water features” around town in recent weeks in order to present them to you here. I don’t often go and sit by them for long periods, simply because my impulse in the middle of the day is to get my blood circulating. If I had more time I would. Nevertheless, here are several places downtown where you can go and be near water in feckless, frolicking motion. The list is not exhaustive, I’m sure, but it’s big enough that I’ve had to break it into two parts (I set out thinking I’d find nine or ten, but I’m up to fifteen already) and includes one fountain that’s been dry since the last millennium. Let me know of other ones you’ve discovered! First off, we’ll explore places west of Third Avenue toward the bay, then later we’ll range further up the old slope. West of here, Union Avenue is a series of stairways. We’ll start at the point where Union Street ends abruptly in the driveway of the new Four Seasons Hotel. 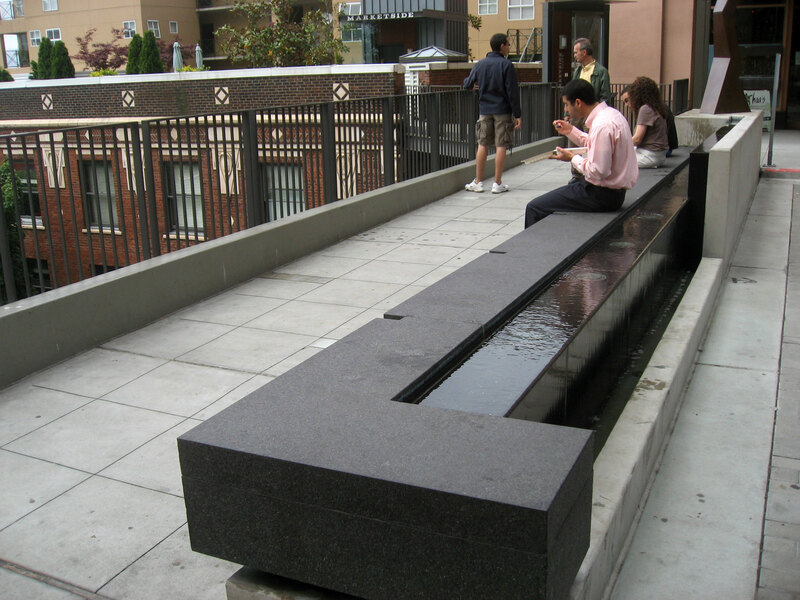 I see from satellite imagery that the hotel has a pool on the roof for paying guests, but for working stiffs like you and me shuffling around at street level, this little bench fountain will have to do. I’ve walked by this installation a million times and even probably sat on it, but I didn’t realize that water was trickling over the back side of it until I was out with my camera specifically looking for water trickling over the back sides of things. The view directly across this man’s pad thai from him is really a nice one. The ferries from Winslow and Bremerton shuttle in and away again as your eye muscles practice looking into unobstructed distance. Best time to go: Morning, when the sun is on the Olympic Mountains and the bay is really blue. There are fountains all the way down the Harbor Steps. You can sit right on the water jets if you've a mind to. University Street used to “go right through”, to repeat Woody’s phrase from three posts ago, from the waterfront up to Capitol Hill. In the late 1990s the old buildings on both sides of University between First and Western avenues — buildings which I assume were derelict — were razed to make way for Stimson Bullitt’s pet project, the Harbor Steps development (if you sniff around, you can find some stone arches from one of the original buildings’ facade that have been preserved). I can’t imagine the political power one would have had to wield to get a street closed off but the prince of the King Broadcasting dynasty had just that kind of clout. Well, what’s one less steep hill to drive up in Seattle; we’ve got loads of ’em. 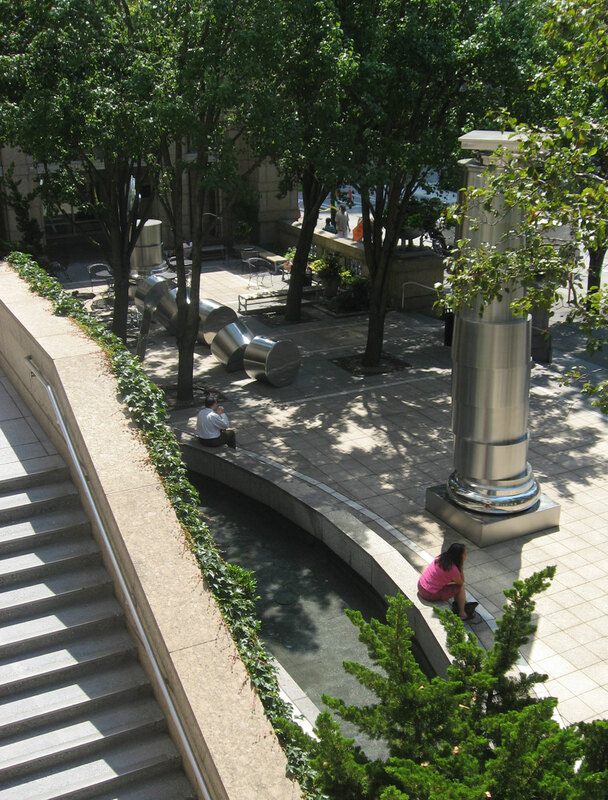 What we got in exchange, besides four mixed-use towers of apartments and ground-level retail, is a long and wide set of public stairs with fountains at several levels and space midway up for musical performers to play for a populace that loves to sit outside whenever it isn’t raining. Best time to go: Fridays in summer, when there’s free music. A cool sound on a hot corner. 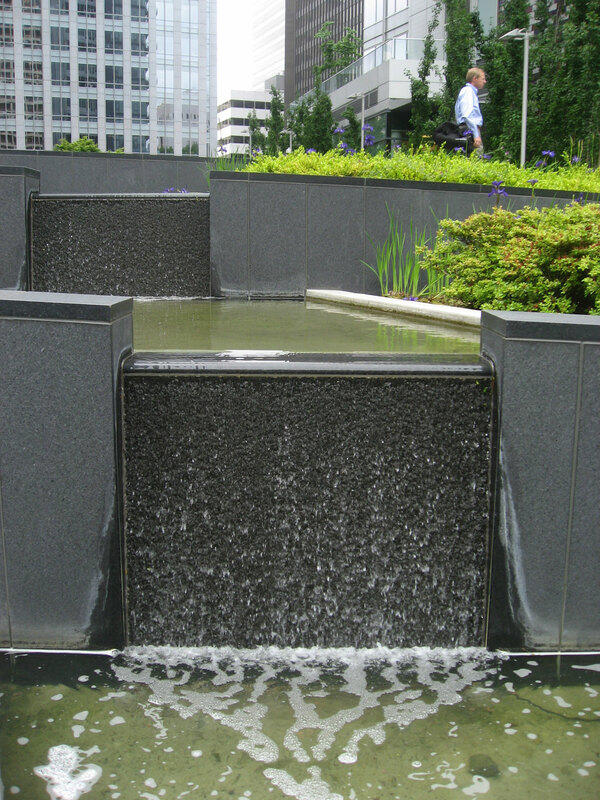 One of the fountains in the Benaroya's Garden of Remembrance. 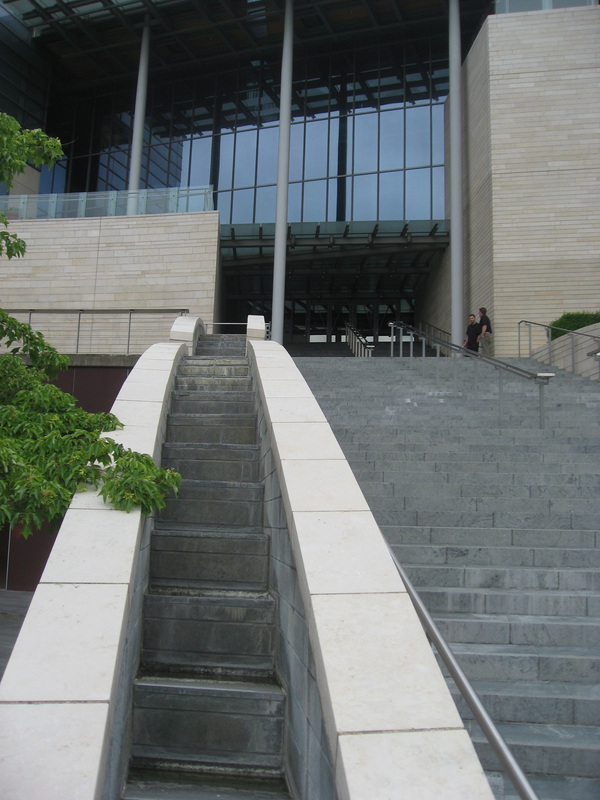 Further up University, on Second, Benaroya Hall reposes like…like…well, it’s there if you care to go see it. It’s a nice symphony hall, built as a structure within a structure, the first sitting on giant springs inside the second to keep the building from shaking the horn section offstage when trains pass through the downtown tunnel in the bedrock directly beneath the hall. The Garden of Remembrance at the Benaroya’s southwest corner honors our war dead, the names of fallen local veterans carved in the thousands in giant blocks of what I believe is basalt. Next to these monuments, water cascades over rough walls of the same stone. It gets hot on this corner if the sun’s out, so this one is ideal for springtime. The courtyard at the old bank. 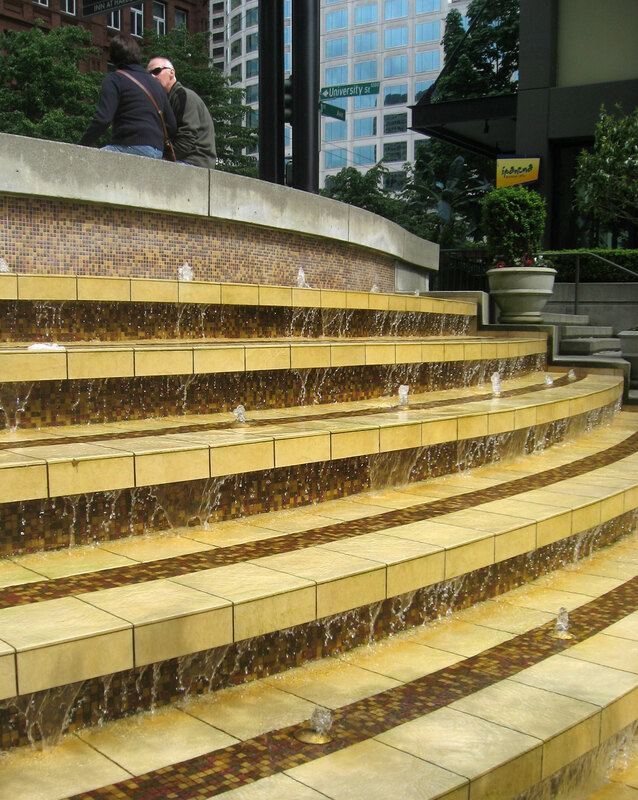 Nextdoor to the Benaroya in the lower courtyard of the WaMu/Chase Tower, water just pours out of tubes into a pool as from any old gutter spout, but the environs, which I’ve written about before, are very pleasant. Duke remembers goldfish in the Prefontaine fountain. 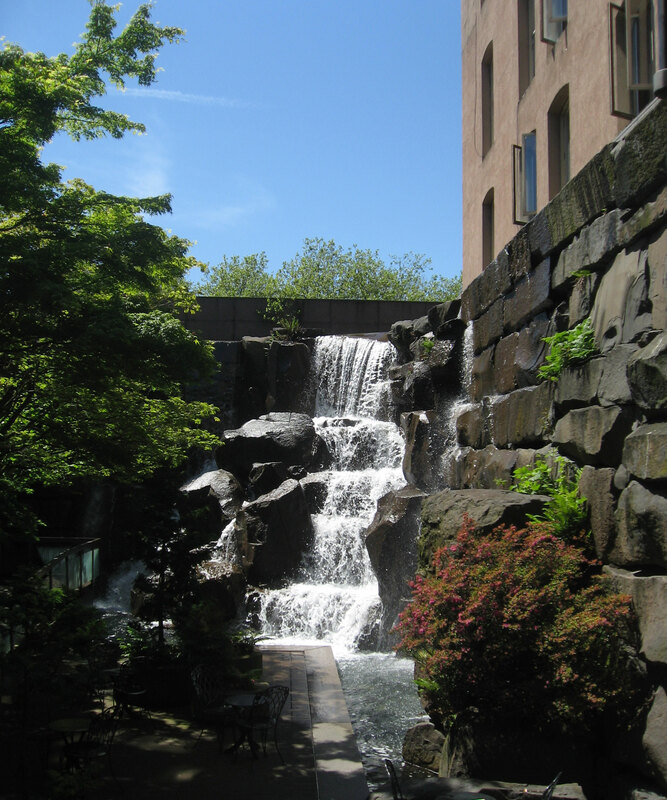 How do you hide a waterfall in the middle of a city? It's been here for more than thirty years. Here’s one you may not ever have seen because it’s easy to miss. 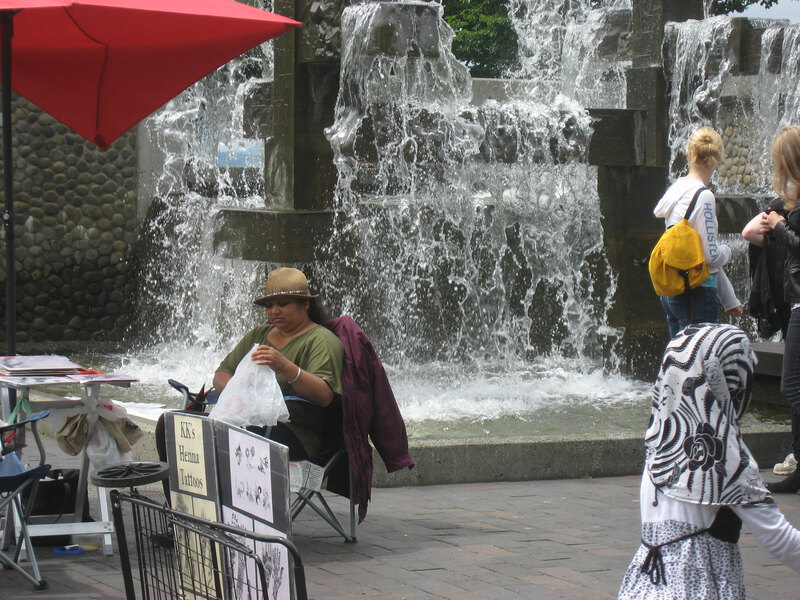 On the corner of Second and Main, just east of Occidental Square in the Pioneer Square neighborhood, is a bona fide waterfall. It’s inside a miniscule park surrounded by high walls on the site of the offices — now gone — of a little company once called American Messenger Service, which became United Parcel Service. Jim Casey, one of the founders of the company, also started the Annie E. Casey Foundation, the philanthropic outfit that commissioned Waterfall Park in 1977. Bring a sack lunch or some take-out and sit at the tables and chairs. This one is good during the heat of the day because of the cooling mist. And unless you see a jet fly over, there will be nothing to remind you that you are in the heart of one of the West Coast’s biggest metropolissesses. This is the best I can do with this location. I kept thinking, didn’t there used to be a fountain at the Ferry Terminal before they remodeled its entrance? 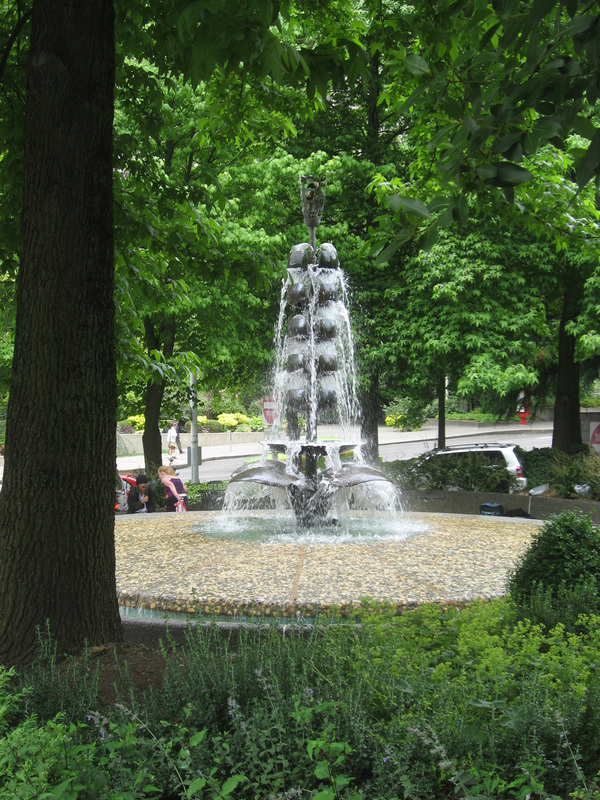 I zimbered over there recently and found this vintage fountain which I’m almost sure is by native Seattlite George Tsutakawa. It looks a lot like another one that I know to be his creation that we’ll look at in Part II when we head for higher ground. My very unreliable (yet native!) memory tells me this fountain was originally at the bottom of a long, silly ramp that led up into the fairy terminal, apparently before elevators and escalators. In fact, I’m sure it was there, which means that two of Tsutakawa’s fountains that I know about are in locations other than where they started out. This one’s been reinstalled a good scoot to the south, right next to where all the cars pour into the ferry ticket booth lines. Consequently, it’s hard to get photos of this fountain that really make it sing. I’ve posted two, one putting forward its best foot — even though its shape rather gets lost in the bushes — and another facing south to show you the proximity not only of the rush of island- and peninsula-bound traffic two feet beyond the fountain, but also of the industrial (Port of Seattle) neighborhood beginning a few doors south. And I didn’t even include the one with that damned Tyrannosaurus Viaductus in the background. Best time to go: Morning, I’d say, since it’s out in the open and there are no trees around. Avoid baking hot days and evening rush hour. A busy location through the spring and summer months. Here a henna net is cast for tourists. Moving north along the waterfront we come to an installation given to the city by the daughter, and in memory, of Edward M. and Margaret J. Harrington. A plaque there notes that they “loved this city”. 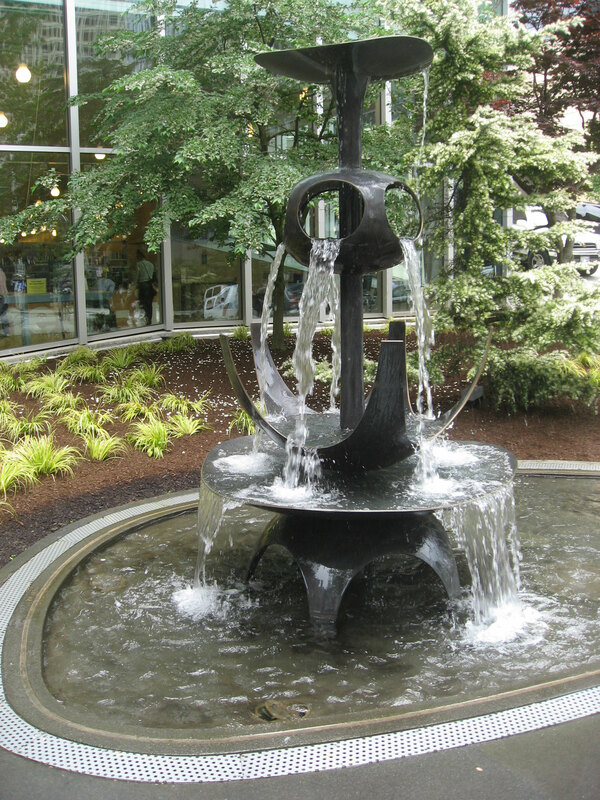 The fountain, which stands in the Waterfront Park next to the Aquarium, was started by sculptor James Fitzgerald and finished in 1974 by his wife Margaret Tomkins after he died. 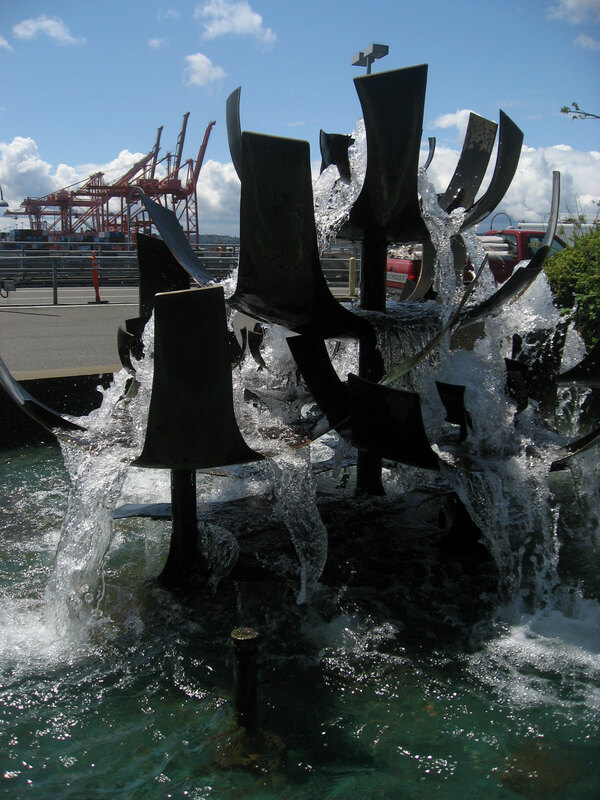 I prefer fountains that are not so square and industrial-looking, but you can sit next to this fountain and go completely deaf to the racket of the Alaskan Way Viaduct across the street. You can also get henna tattoos by KK. 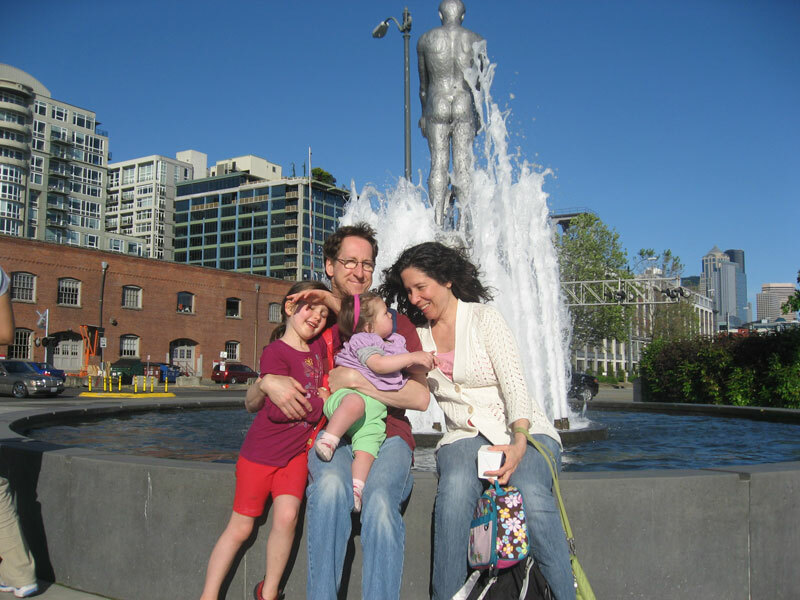 Paul Dorpat has written about the people behind (figuratively) this fountain here: http://pauldorpat.com/seattle-now-and-then/seattle-now-then-waterfront-park-fountain/. Sittability: Okay. The low narrow curb is not comfortable, but there are benches nearby. Best time to go: If you like bumping elbows with tourists, go anytime in summer. "Father and Son" above father and mother and daughters. 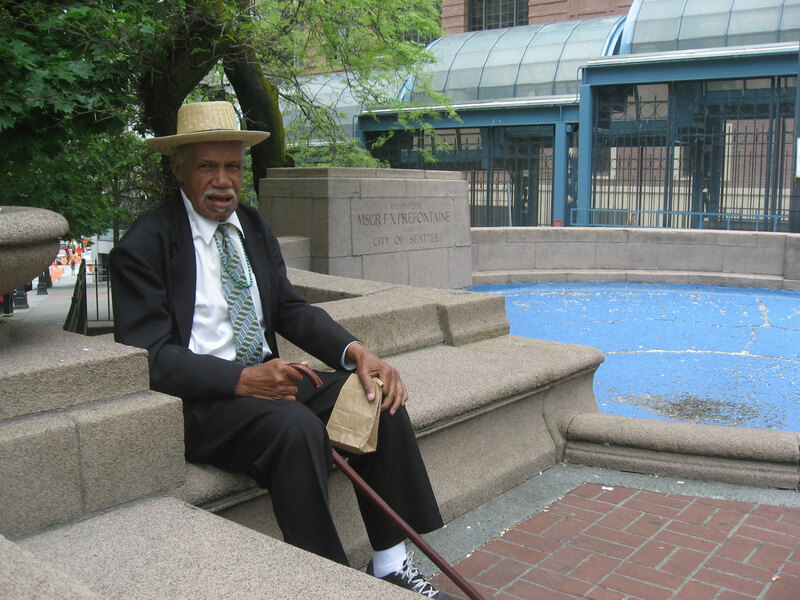 We finish at the waterfront’s northern end, below this gentleman’s…er…southern end. You saw this fountain a week or so ago when I was gushing thankfulness that the sun had come out. Here I and my nuke are enjoying an after dinner walk with friends. The trick about Louise Bourgeois’ “Father and Son”, the sculpture that stands literally in the midst of this fountain at the southern end of Olympic Sculpture Park, is that the water jets change pattern every so often, so that either the son is visible and the father is hidden by water, or vice versa, or they are both visible. (It’s about the difficulties in intrafamilial male relationships and what I would call “unavailability”). I don’t know what the interval is, but I think I once heard that it’s on the hour, and that makes sense, but guess what: for all the times I’ve walked past this fountain, and stood next to it, and stared at it while we ate at the Old Spaghetti Factory across the street, I’ve never seen it change. It always just suddenly is changed the next time I look up. It happened last week. I walked by it at lunch when the boy was visible, turned around a hundred yards later, and came back to find the man visible. I looked at my timepiece (okay, phone) and saw that a clock hour had ended during that few minutes. Sound quality: Loud but not obnoxious. Best time to go: Any time you can spare 61 minutes in a row. Spring is always a pretty busy time for us, and I was taking pictures all season with a view toward blogging, so I have the material, but I have not had the hours when I’ve also had the poop to write. So this will be a sort of visual tour of some of the funner things we got up to since April. At Kelsey Creek Farm. Which way to the long lines? 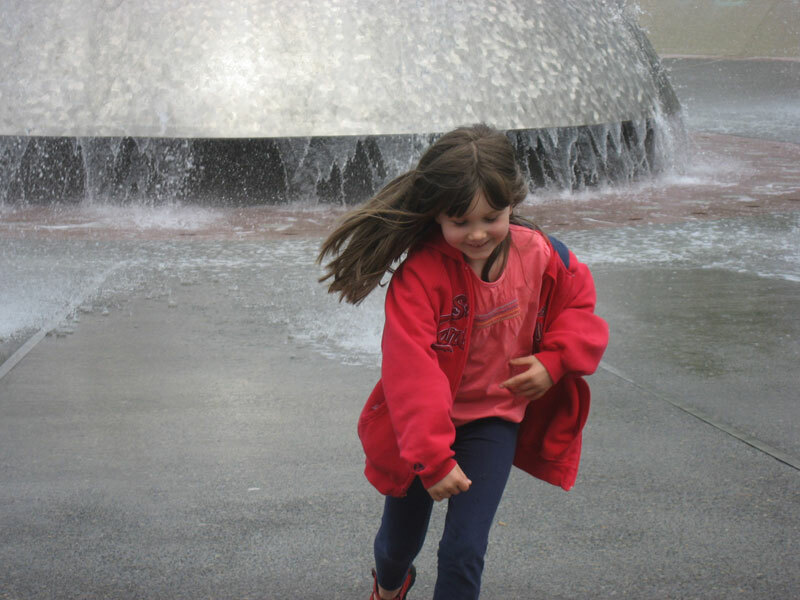 It seems like a lot of the photos I have are of Mara running, but that’s good in a way — it means we’re succeeding in getting our older daughter out of the house for the adventures she needs to occupy her very busy brain. Though Mara’s baby sister Emilia is also turning out to be a person who approaches life very kinetically and “hands on”, her tender age means she needs the opposite — lots of naps at particular times, which is why Mara and I have been swashbuckling as a duo a lot lately. Emilia and a favorite admirer. Photo by Angela. 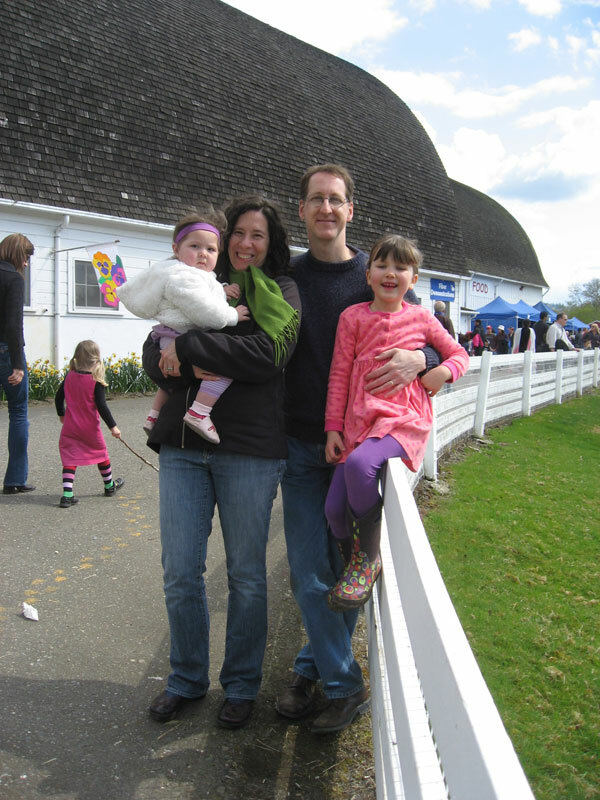 We did all manage to get to the sheep shearing festival at Kelsey Creek Farm in Bellevue again this year, and even were joined by a very special friend of our family. That was on the last day of April. 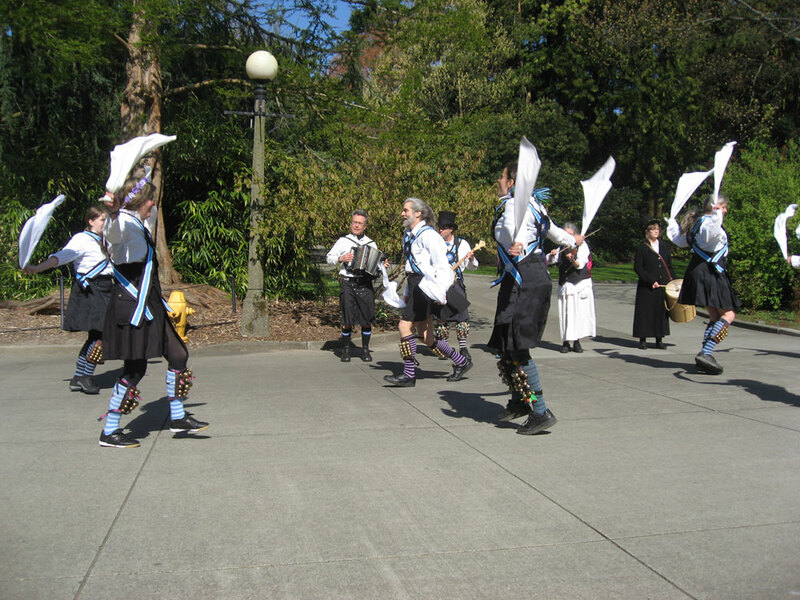 The day after that, Mara and I got up early and beat it down to the Hiram Chittenden Locks in Ballard, also known as the Government Locks or “Gummit Locks”, where some Morris Dancers we knew were ringing in the May with dances and songs of spring. Powering up for a day of adventure. The Morris group Sound and Fury out early for a lark at the locks. 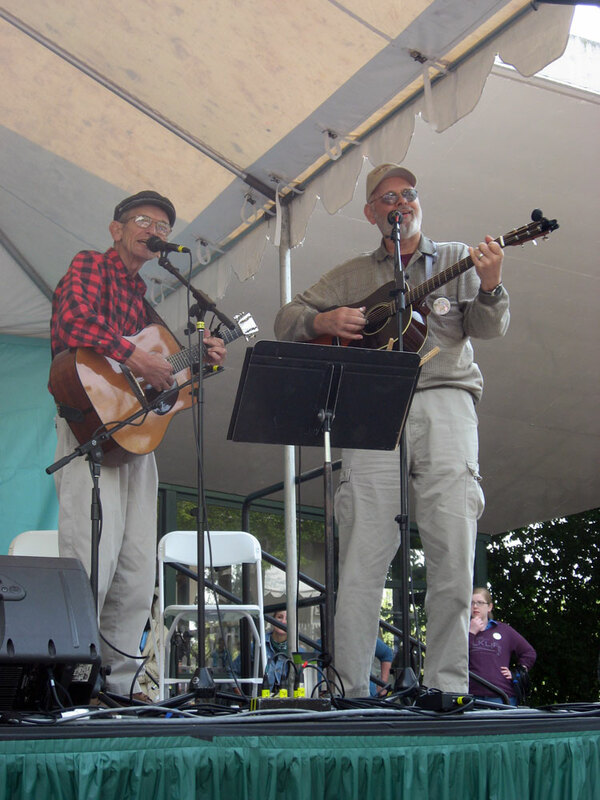 Then Mara and I did Folklife. 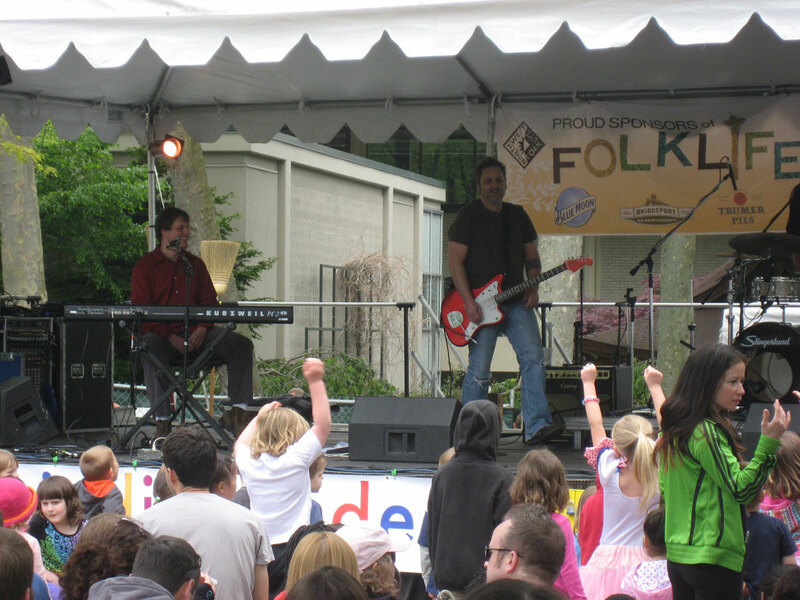 I wrote about Mara’s first Folklife festival two years ago; it was so fun that first year that we went two days in a row, and both days she ended up getting herself soaked in the wading pool. We went last year, too. 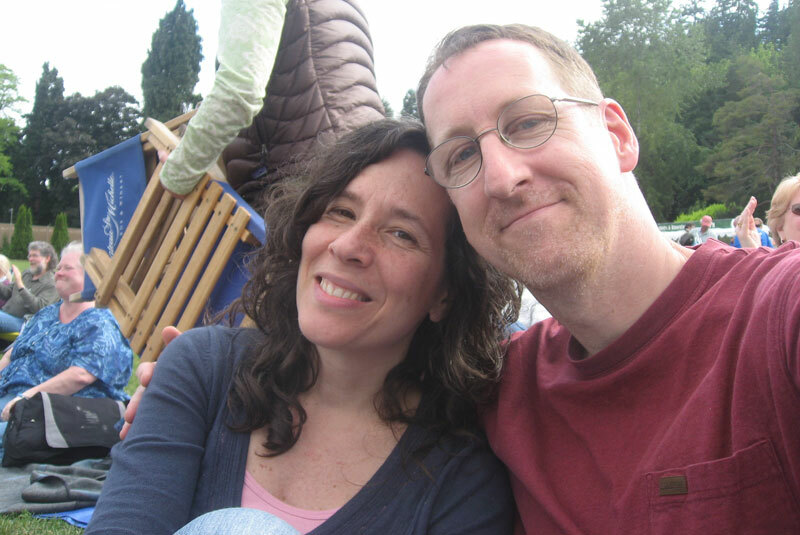 This year, Mara and I rode the 16 down to the Seattle Center and met some friends. I spent most of the day blazing a trail for Mara and her friend Gem and Gem’s parents through a crowd of festival-goers that turned up in spite of a lousy weather forecast, and when you spend your day like that, you get to the end of the day and tally up what you did and it turns out to be only about three things, two if you don’t count getting food, and one if you don’t count finding a bathroom. 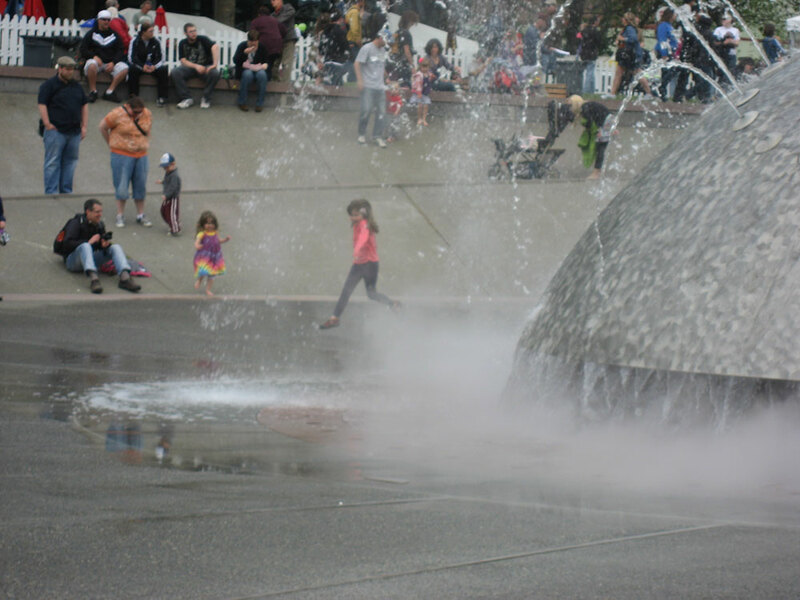 Mara dodging the fountain's tentacles of water at Folklife. Down in front, Mom. Five-year-olds mosh to the sounds of The Board of Education. So we walked around a lot and we heard a lot of music peripherally, but we didn’t really get to hunker down and enjoy a full set of any single act’s music. But that was okay, because kids like to keep moving; they’re grazers. We caught a little of this on the way to here and a little of that waiting for one of us to return from the restroom, a little of something else while standing in line for an ice cream cone. Because of all the crowd-wading, I didn’t get a lot of photos. I didn’t get a picture of Mara wearing the balloon sword and scabbard and helmet that the balloon artists made her (they were the same ballooners that we encountered last year at the University Street Fair), nor any decent shots of her in the wading pool, which has now become a tradition, a checklist item. A tribute to the songs of Woodie Guthrie. Some amazing musicians stepped up for this. Mara and water chasing each other. This happens a lot. It was like that at the sheep shearing, too. 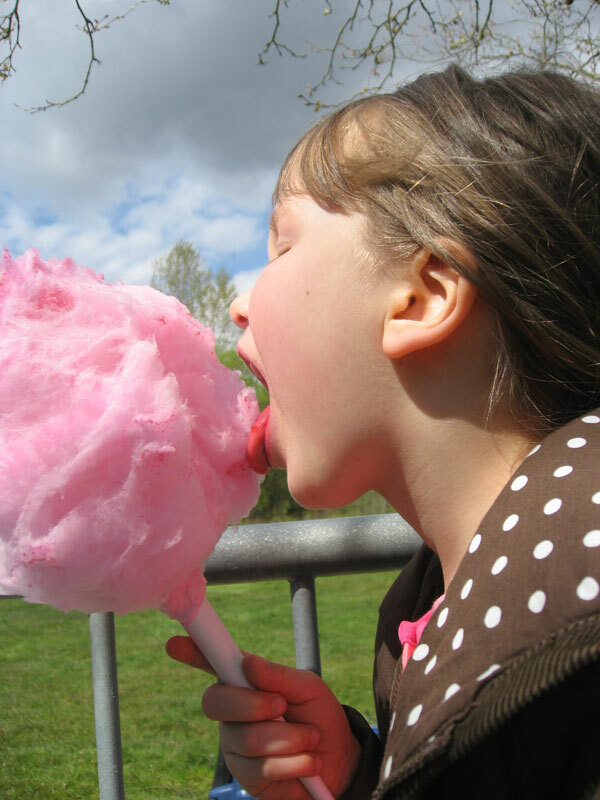 We spent four hours there and really all we did was stand in line for the tractor-pulled hayride, then eat some lunch we’d brought, then stand in line for the pony rides. By the time we’d gotten through all that, they’d finished with the sheep shearing. Not the end of the world, since we saw it last year, but it’s no wonder you come home exhausted. It’s a lot of walking, carrying, and standing in line, and you don’t realize how many hours are going by. The tractor was an early contributor to the ruin of the American small-holding farm, but when you look at one of these early Farmalls, you can see the appeal. 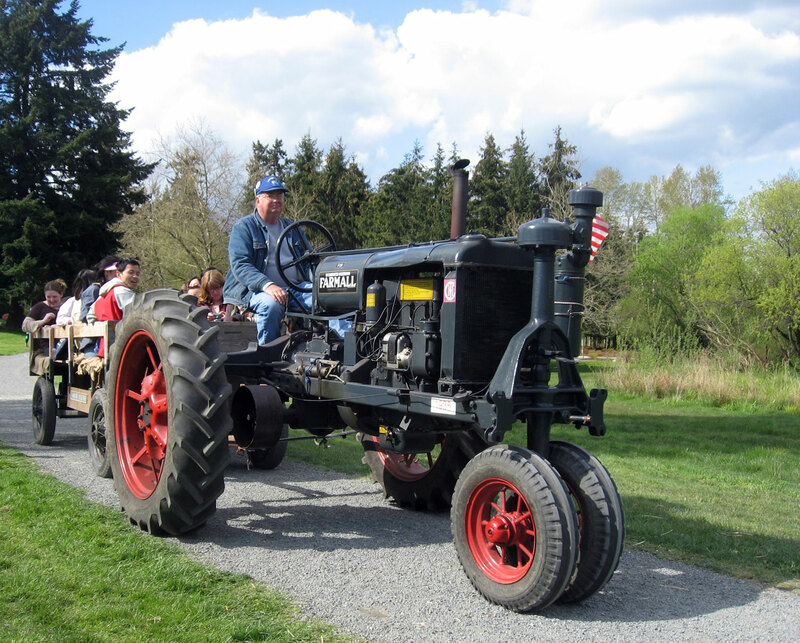 There was also a Ford, a Deere, and an Allis-Chalmers. One dizzy pony. No Oscar, but Blossom treated Mara well. 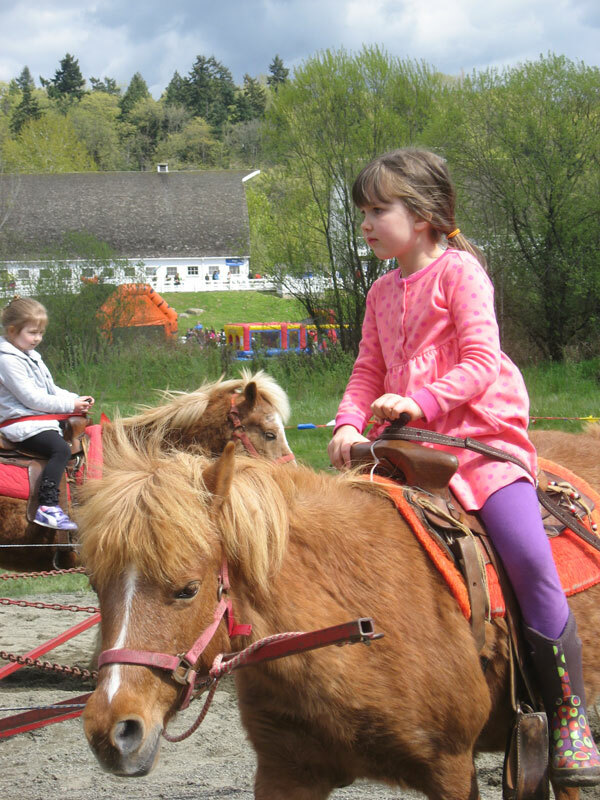 As a side note, the pony rides at the sheep shearing were kind of anticlimactic this year. We had hoped that the same “ponies” would be there this year as last year (they were full-sized horses), in particular the one Mara rode named Oscar. We have talked about Oscar the Palomino ever since last year. But this time they had only very small ponies, and instead of being led around a large ring they were hitched to a merry-go-round that moved in a tight circle, as if they were milling flour, and there was a sign that said “You must be no taller than this sign to ride the ponies”, a sign than which Mara was slightly taller. They let her through anyway, which was a good thing, because we’d stood in line for more than an hour before arriving at the sign, and I’m not sure who’d have thrown the bigger tantrum, Mara or her dad, if she’d been refused. As an early Father’s Day present, and really just because we’re such big fans, Angela treated me to A Prairie Home Companion for a second year in a row. Last year we attended the show for my birthday. Since I wrote last year about the show and what it means to me and to us, I’ll forego the background this time. 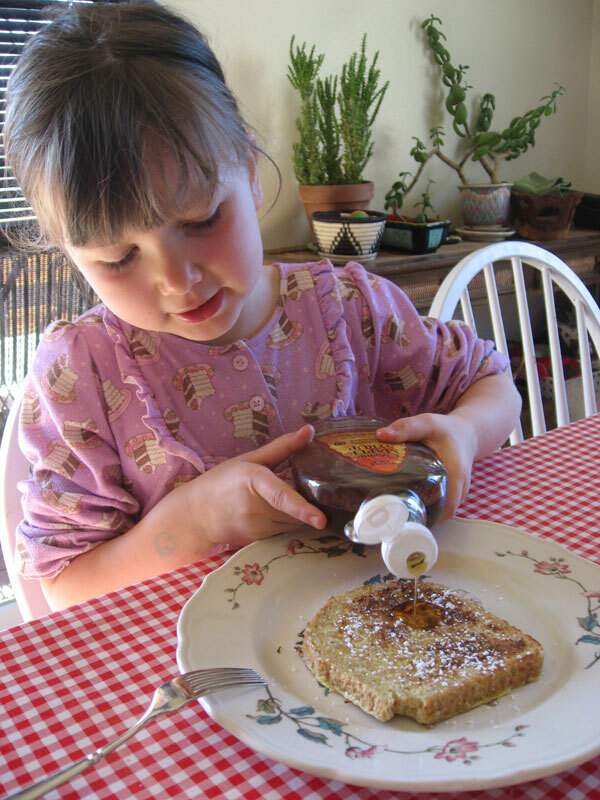 Saturday morning, after a month of biting her tongue, Mara forgot herself as I made french toast for her and said that if we wanted to see “the show” that day we’d have to take our own chairs. Well, that pretty much sealed the venue. I told Angela that I had a pretty good idea of where we were going (not in front of Mara though, she would have felt bad), and then Angela decided she wanted me to know, then wanted me to guess. I guessed right. 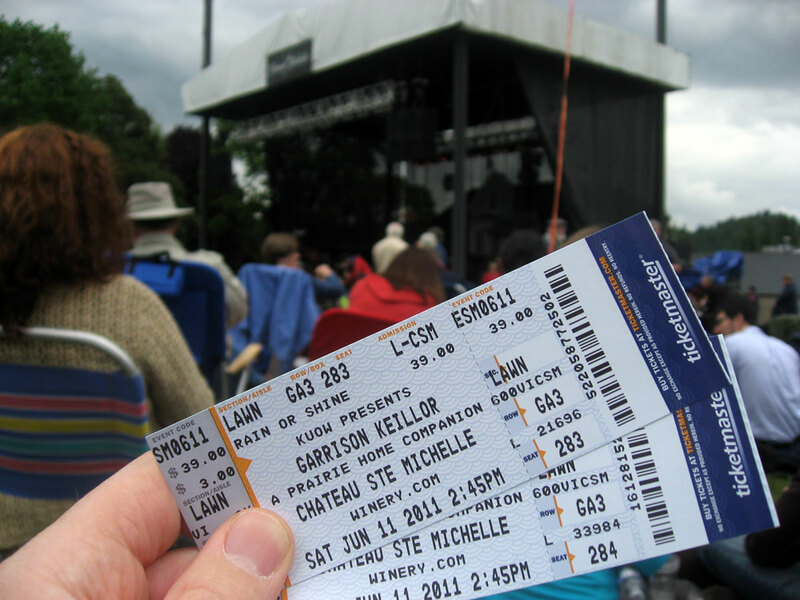 We arrived early, like everyone else, and fetched ourselves up on the big lawn. 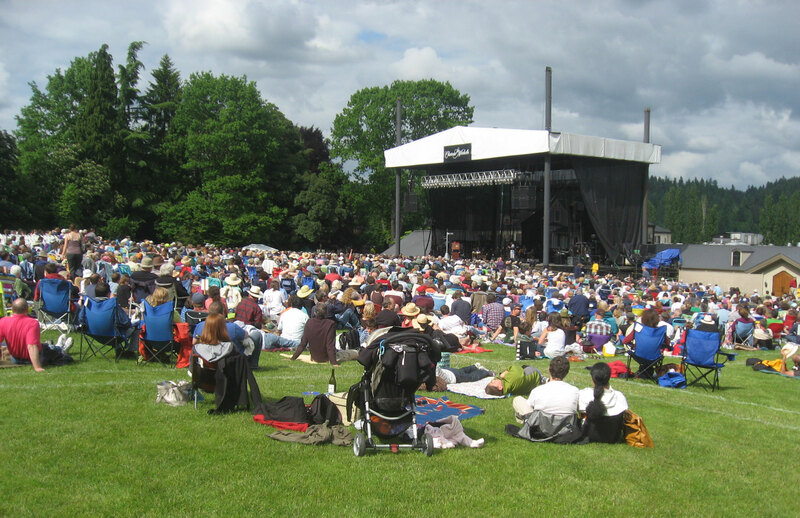 The lawn is not naturally amphitheatre-shaped, and being a fretful person I started to worry that my experience of the day would most prominently feature the fountain of red hair that sprung in a large and lively mass — even before she fluffed it — from the head of the woman a yard or so in front of me. But then I finally realized, hey…this is a radio show. No worries. In fact, for much of the show I ended up just closing my eyes and enjoyed being stretched out next to my sweetheart under the cumulus-dappled blue skies over Chateau Ste. Michelle, while the swingin’ a capella stylings of the Bodacious Ladyhood trio and — even more impressively — Sarah Jarosz’ dark-edged folk rock and bluegrass wafted out from the stage. Last croon on the lawn? An episode of Guy Noir: Private Eye unfolds before us. 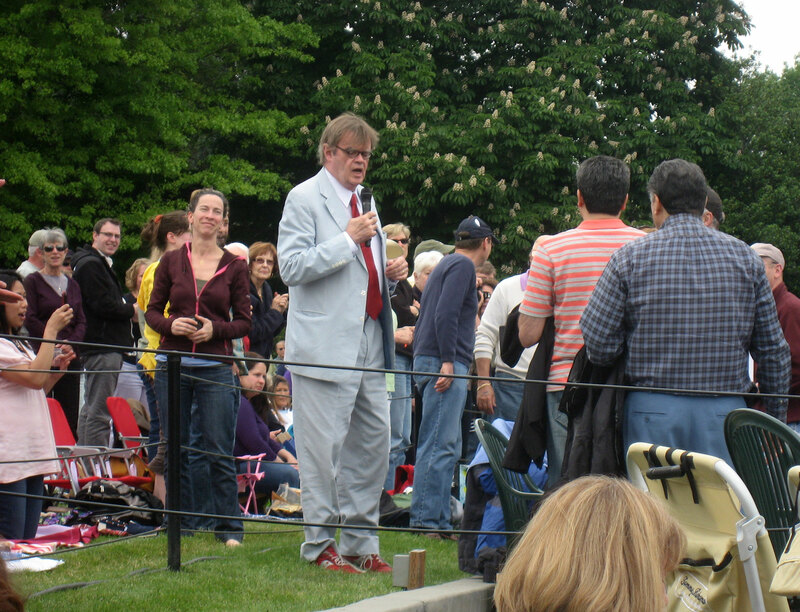 A highlight was the pre-ON AIR intro, when Mr. Keillor came off the stage with the microphone and strolled the big lawn in his signature red shoes singing old anthems and songs, hoping to entice the crowd into singing along. He didn’t tour our quadrant but he came close. Another is anything that Fred Newman, the sound effects wiz, does, and he did plenty for this show, including an entire bit at the end after all the impatient-to-get-out-of-the-parking-lot people had already folded up their Costco lawn chairs and were halfway across the big meadow so that they had to stop midfield and look like the impatient-to-get-out-of-the-parking-lot people that they were. I think I’m most fond of Tim Russell, who plays Armand, the maitre d’ of Cafe Boueff, as well as a host of other characters including Lefty (or Dusty, I can never keep them straight) in the “The Lives of the Cowboys” sketch, which they didn’t do this time (nor did they do it when we saw the show last year). You mighta seen us there...My picnic partner and I. On the way back from Honeybucket Alley at the south end of the big lawn, Angela ran into a friend of hers who said that she’d heard that this was to be APHC’s last Seattle engagement because Garrison is leaving the show. If that’s true then we’re really bummed out, because we had just decided while driving over to Woodinville that we should make APHC an annual tradition. We didn’t bring Mara with us this time, even though she loves listening to “The Lives of the Cowboys” (we sometimes turn the knob down or start coughing real loud during the occasional risque parts of this segment and “Guy Noir: Private Eye”), and now it seems she might never get to see Mr. Keillor do the show live. We regretted not bringing her, especially since in this venue kids who got the wiggles could be escorted to the far end of the lawn to run around where the show could still be heard. I googled and found where he’d announced that he’ll retire in 2013. Rumors say Erica Rhoades, whom I believe I’ve heard guest-host the show a time or two, is in talks to become his heir, but these are merely rumors as far as I know. If Garrison brings the show back to the winery we’re taking Mara for sure, and maybe Millie too just so we can tell her she saw him live. I stepped to the back of the crowd to get a shot of the whole event. The sun breaking through at that moment was announced live on the air. 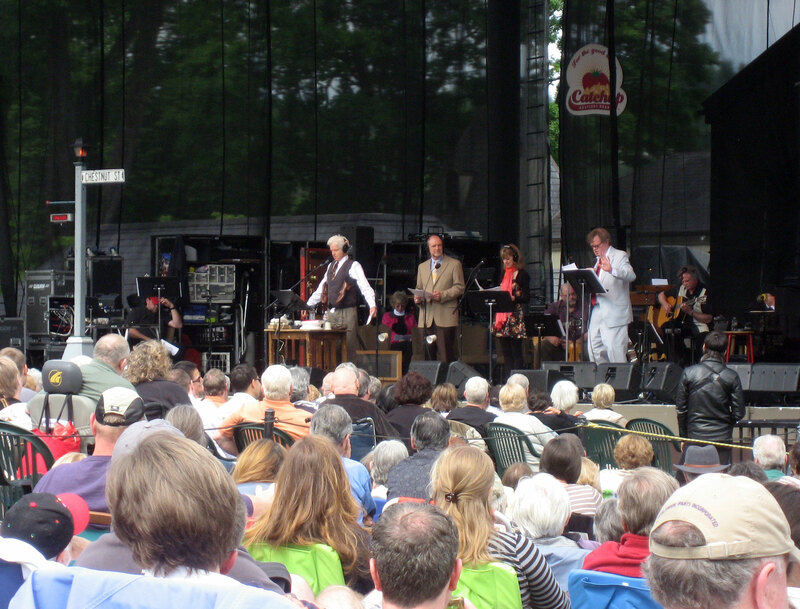 Most people find the idea of a Garrisonless Prairie Home Companion an oxymoron. I think I would be grateful that the show would continue on if it does, and I’d compartmentalize and think about these good ol’ Garrison days as the first incarnation of a great tradition. I’m sure there are fans of Jay Leno who don’t understand the loyalty of the fans of Johnny Carson, and fans of Carson who [ditto] Jack Paar. Then again, not even Johnny’s 30 years on “The Tonight Show” matches Garrison’s run. It was a great day out. We’ll do it again…if we get the chance. Cinema and television teach us that grouchy old men who speak their minds are to be trusted. There’s an attractive — and dramatically useful — turn of story in an overly masculine ego trying to protect a vulnerable and charitable nature underneath. The fact that such men endure obvious pain to talk with foolish ordinary people is an indicator of their better selves. I’m thinking particularly of Curly Washburn in City Slickers, whose maxim about focusing on “just one thing” is wisdom I wish I’d come across early in life, but also of the grandfather in Heidi, Lou Grant from Lou Grant and Mary Tyler Moore, Grandpa Hoover in Little Miss Sunshine, Grumpy from Snow White and the Seven Dwarfs (sic), and take your pick of John Wayne’s or Jeff Bridges’ Rooster Cogburn in True Grit. Mean as a rattler but ultimately helpful. 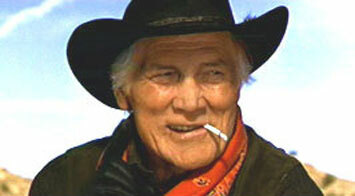 Jack Palance's Curly. Mara has already learned this. I took her with me one Saturday morning a weekend or two ago when I took my gas-powered lawnmower, a machine that I loathe, to a Repairer of Small Engines on Beacon Hill, which for you out-of-towners is one of the seven ancient hills upon which the city of Seattle was founded. It is one of the more southerly hills, fully across town from where we live. The repair man, whom I’ll call Jim, was a grouchy old man, though I would not say very old. He had hawkish bushy eyebrows and a white moustache, like a more tidy Mark Twain. He was hard of hearing to begin with, and disinclined to listen to a middle-aged suburban weenie to end with, so there you go. He flopped a pad and pen onto his workbench and told me to write down my contact info. Then, after instructing me to fire it up, and after listening as the mower instantly conked out, he said it was probably the diaphragm and told me he’d get to it by tomorrow. Thirty-eight bucks. I dithered for a minute until I realized he had no further use for me. He hadn’t said a word to Mara. “He seems like a nice man,” she mused as we walked back down his driveway. You just know that after he reads you the riot act, he's going to give you 24 hours to prove your hunch. 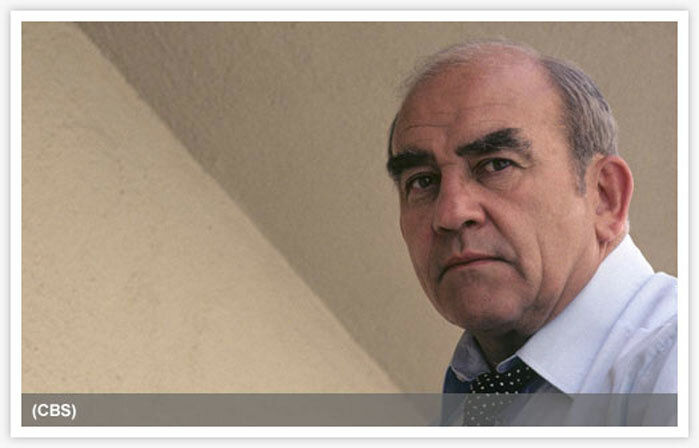 Ed Asner's Lou Grant. This was the second home-based lawnmower repairman we’d visited. Upon some pretty stout recommendations, I had taken my mower to someone even further away a few months ago, a non-grouchy, even friendly person who’d given it what he called a complete tune-up. The first time I’d used it after the tune-up it worked fine. The second time, it started choking and gave up completely in the middle of the patch of clover that comprises our backyard lawn. I didn’t want to travel so far again; it’s a lot of time. And anyway, I get a yucky feeling when things like this happen — I know I should let a small businessman make it right if he missed something or forgot to put the whatsit back on the thingamajig, and maybe he would fix what was wrong without even charging me, but he’s already sort of one notch into the doghouse. Plus, his abbreviated hours on weekends made things difficult. I called a lawnmower place on Aurora North, just a short drive away, but they said they were booked for two months. I could hardly believe it. Who’s booked for two months? Like these people are so well regarded that citizens with lawns to mow will wait for 60 days for their mowers? I wondered if there was some epidemic going around, a lawnmower virus, something in the gas, or maybe the End Times really are here and small engines are failing in droves. But in the end I dialed Jim’s number and asked if he could look at it sooner than two months. He said bring it down. After dropping the mower off at Jim’s, Mara and I stopped at a playground we’d seen near his house, a large, beautiful park called Maplewood, where we asked a mail carrier who had parked his truck in the parking lot to take lunch if there was a good local burger joint around. He said there wasn’t a single place like that on all of Beacon Hill, which I found hard to believe. But he was right. We ended up patrolling the hill back and forth before finally giving up and heading up to get a burger in our own neighborhood. True, we stopped at a yard sale and bought some hats, but I was still surprised when we got out of the car at Burger Master and my cell phone was ringing already and it was Jim telling me that he’d finished and I could come and get the mower. He was open until eight. Mara was torn between going back with me to get the mower and walking to Mighty O Donuts with Angela and Millie, but I would not say she was very torn. I ended up driving back to Jim’s by myself. Foul-mouthed and perennially in a bad mood, but he's the only one who sees what's important. 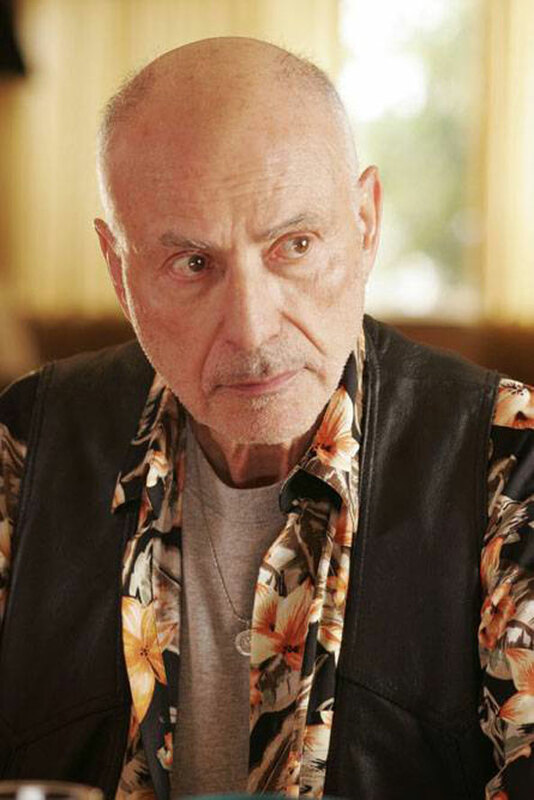 Alan Arkin's Grandpa Hoover. He was in the same humor as before when he emerged from the back door of his house. There were no lawn mowers in his driveway, but he opened up his garage and I saw a line of mowers spooned up like shopping carts, and that big monster of a rider. “What was the name?” he asked. I told him my last name, and he pulled out my mower. “Start it up,” he said, and then went about trying to find the diaphragm he’d pulled out of it, which he said was the worst he’d ever seen. Certain of his words seemed to rumble with a raw edge, as though Yosemite Sam were saying them. “Worst”. “Seen”. The mower started up beautifully. I let it hum for a second and then shut it down and started writing a check. He couldn’t find the old part. He seemed eager to use it as a visual aid in teaching me what old gas does to such a delicate organ, like someone trying to deter people from smoking by showing them a smoker’s lung. “You won’t have to tell me twice,” I said in an attempt to appease his ire, but he shot back with a snort, “Well, I’m not gonna remember YOU next year.” A wan smile held my face for me while I tried to figure out what his rejoinder could mean. He went on crabbing about how you should store the mower over winter with no gas in it, let it run out. He'd really rather you went away, but this is the man who's going to carry you through the darkest night of your life. 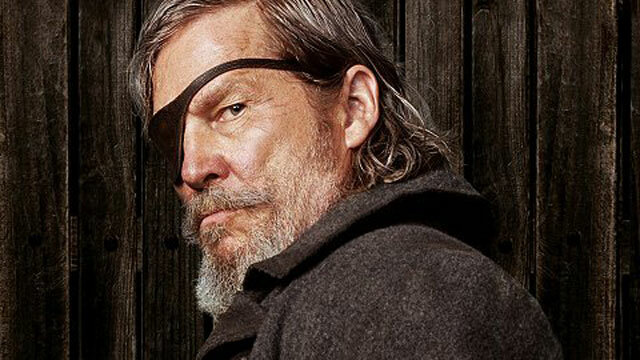 Bridges as Cogburn. Feeling that he was softening, I pressed on in my quest to redeem myself as the imcompetent owner of the mower with the most abused diaphragm he’d ever seen. Even though he seemed to be edging away, I asked for clarification. “So, the gas that’s in the mower now I should dump out, right?” If I’d thought about that question for a moment I would have asked anything else, like what his favorite color was. “Well,” I said. I was unable to absorb any more cantankerosity, so I turned to the mower and began wheeling it to the back of my car. I noted silently that he’d told me to come get the mower and he’d said he was “open” until eight o’clock. “Sorry,” I said, but he had already disappeared toward the house. I shouted “Thanks!” over the top of his garage. I felt like adding “…you grumpy old fart” but really, I was very pleased. People who can fix mechanical stuff with their hands are a national treasure, to my lights, and if these Keenan Wynns and Walter Matthaus and Burgess Merediths manage to stay in business, you know it’s for all the right reasons. 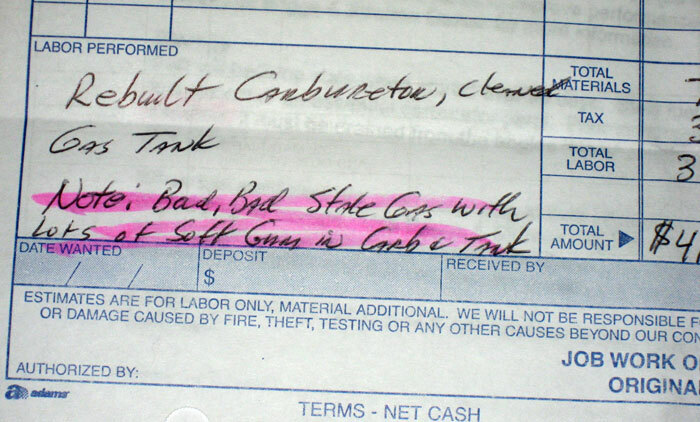 My report card: "Bad, bad stale gas..." Jim added the purple highlighting for me. Note: I started this a few weeks ago, set it aside because I wasn’t sure about posting it, and returned to finish it tonight. I might yet regret it. This is how I look when I talk. Among the loosely held rules that govern my blogging, two are rather more prominent than others, and with this first sentence I have broken the second one. The first one is that I don’t want my blog to become a journal — that is, a comprehensive daily or weekly (or any-intervally) report. We know the word blog is a shortening of weblog, literally a log on the web, and a log is a journal, but my blog is not my journal. I did journal every day for many years starting when I turned seventeen, and the writing of my life took over my life, until I resented the paper and pen. I wrote long into the night trying to keep up with it all, but I could not write as fast as I lived. The detailed forensic accounts of my daily activities and my thoughts and emotions around them took so long to describe in writing that I was eventually losing time — like Tristram Shandy — against my actual life. But there is another reason that I don’t treat my blog as a journal besides not wanting to return to the treadmill. For the most part my blog posts are deliberately shaped as stories, stories by which I mean to entertain or enrich or challenge or simply distract others who may read them. I craft them (people who know me in real life know I don’t talk the way I write) and I evaluate them when they’re done based on whether I feel I achieved my artistic purpose. In that sense they are a product (even though I collect no fees). Here’s what I’m getting to: there are things happening, wheels turning, seasons beginning and lives ending, that go unmentioned here because I don’t want to behave as though the world and its events are simply fodder for my self-centered little websqueak. I think that time really is a great arbiter of when things become appropriate to treat in that way, at least for me. To write about some of these things too early feels a little…I used to know the perfect word for this but it has flown me. Something akin to utilitarian, crass, disrespectful. I’m struggling with that, frankly, because Death has ridden into my town leading an extra horse, and has tied both of them up in front of the saloon, where he is patiently waiting for a member of my family. We don’t know when, but we have begun using the word “soon”, and a couple months back we thought it would be a matter of days. It feels crazy not to be writing about that, but if I did that my blog would quickly change into something I don’t want it to be. Public wailing. I do a fair amount of self-revelation here, but my purpose is usually to present emotional episodes as complete, so that the reader can journey with me through a telling of it, not through real-time experience of it. My blog is the filter for the experience. The reader is not required to feel the discomfort of not knowing what to do or say. You don’t know me. It is not your place to weep with me. I have people for that. (Actually, some of you are those people.) This is a blog. I’m writing vignettes for you. You evaluate them based on whether or not they do anything for you, but you are not called upon to enter the content of the story. Nor has it been long since Death last wandered through. I found out a few months ago that one of my old friends from college, in fact my first sort of girlfriend ever, died in a car accident four years ago. 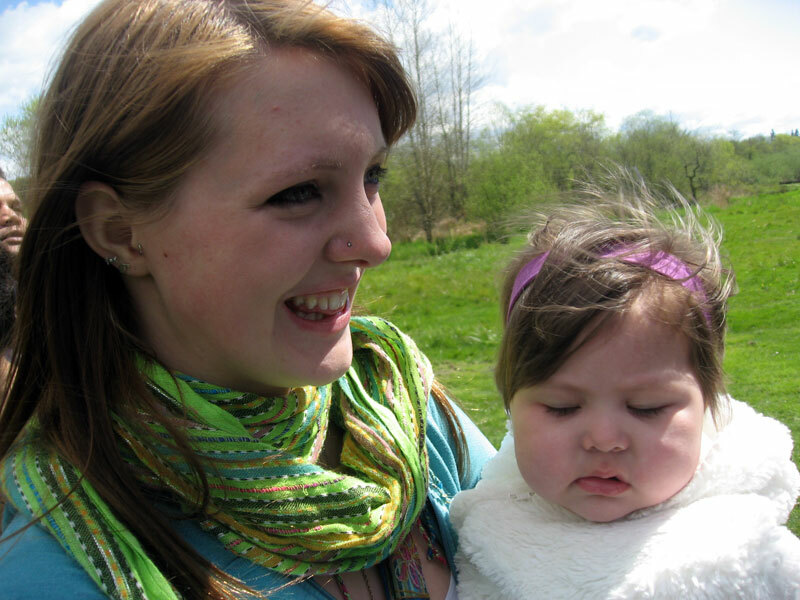 It was a shock to me and to several mutual friends whom I managed to track down who had also not heard of her death. We had all drifted apart from each other over the years so we represented outer satellites beyond the reach of the news that travels among friends. I felt like writing about it the day I found out, writing about how can you not know when someone you have loved so much has left this life, flown this earth? It seems impossible that I was making all these dumb little choices every day — turkey or ham for lunch — while totally unaware that a person once vital to the life I’m now living, the only life I have, is no longer in this life, and is gone forever. I felt there was a lot to explore there. But even now it feels too fresh for me to name my departed friend, to post some of the many beautiful photographs I have of her. For some reason, it doesn’t yet feel like that would be the right thing to do. Anyway, I seem to see Death’s face around a lot lately, both around my friends and family and in the world at large (the disasters in Japan, the “unrest” in the Arab world) but I don’t want to feel like I have to address these events for some compulsion of thoroughness, and even when I feel moved to address them I also feel I should not, at least not yet. A metaphor that comes to mind would be that writing about some events too soon would be like cutting down living trees for carving stock, when really my artistic purpose is best served by driftwood. I don’t know…on the other hand I may be simply fooling myself that a “confessional” style of writing is ever anything but narcissism no matter how much time passes — regardless whether its content is the empearled grain or the bleeding wound. The second rule, the one I am ravaging here today, is that generally speaking I do not blog about blogging, nor do I explain my posts or my methods or my motives (at least not in the post itself — I view my voice as commentor and my voice as storyteller as different entities) unless I believe some additional word will truly better the reader’s experience of the story. Although I loved that show and that episode especially, to me those lines summarize Postmodernism, the infinite self-referential loop, the center of consciousness shifted laterally to gawk at itself gawking at itself. Postmodernism summarized. This is not a clickable video, I don't have the tools for that. There's a link at the bottom. Which is what I’m doing here. This is how my blog looks when I’m short on material, or rather when all the material feels off limits. The truth is, because of the way our circumstances are right now (joyous though those circumstances ultimately are), my wife and I are living quite a small, focused life, and my family of origin is similarly hunkered down trying not to think about something we are simultaneously planning around and bracing ourselves for. This post is like stepping out in front of the big curtain to apologize that there really is no show this evening because…well, we’re all sick with a cold and we’re not getting sleep and we have a toddler and Death is stalking us and we’re overwhelmed. But in so doing I interrupt the illusion of the artistic creation, de-suspend the disbelief of those who have managed to suspend it. This wouldn’t be a problem for me if I espoused the Postmodern, which would allow me to chatter on about the posts I’m not writing, drawing attention to my voice as author (as opposed to my voice as narrator). But I feel that the peak of Postmodernism was bookended by Bugs Bunny at one end and John Barth at the other and that — for me, anyway — creativity lies in a different direction. Besides, Bugs and Barth were funnier and cleverer than I could ever hope to be, which is why I felt relief and hope when I found my hero, the author Joseph Mitchell (though he predates both of those entertainers). Mitchell’s expansive and sometimes exhaustive writing style rejects the cynicism of Postmodernism, rejects the notion that “it’s all been done before so I don’t want you to think I’m really trying seriously here to hit a homer”. Mitchell takes his time and tells his stories as though his words are seeking out just the right reader who would want to hear them told exactly that way. He never interrupts or “winks at the camera”, nor does he attempt to prevent you from putting the book down, getting up and walking away. There’s an assurance and honesty in the work. There is no trick. All that’s going on in the writing is that there is a story being told. Or there is no story being told. Some of you may know that after 1964, when he published Joe Gould’s Secret, Mitchell never published another word, even though he came to his office at The New Yorker every day for thirty years thereafter, and typed on his typewriter. It is one of the most enduring and final cases of writer’s block ever known. But Mitchell didn’t come out with a story in the magazine describing his struggle, didn’t tell his readers to please stand by while he worked through the difficulty. There was just silence. When nothing he wrote seemed to be the right thing to publish, he published nothing. For decades. 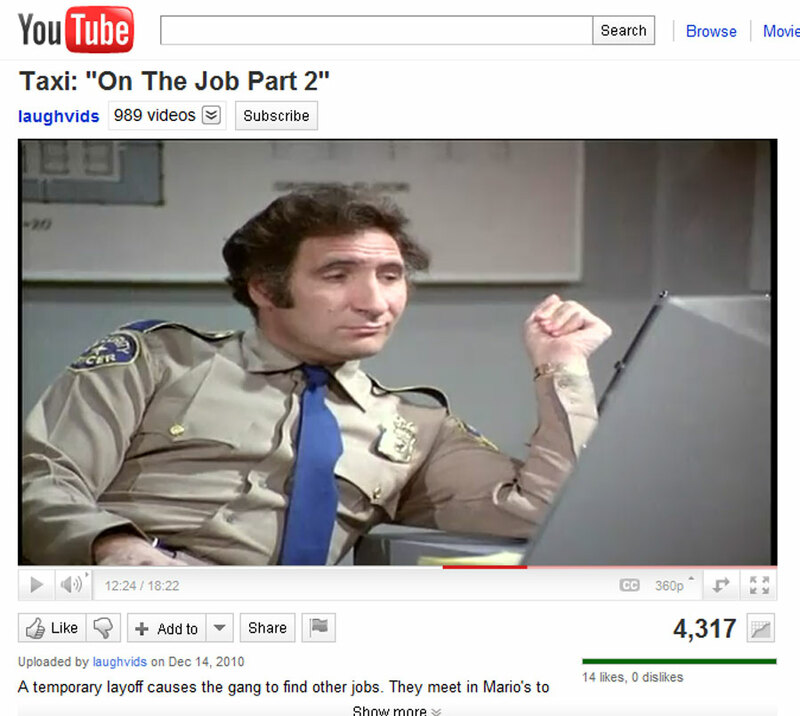 *Part II of the Taxi episode “On the Job” is here: (http://www.youtube.com/watch?v=Ns8paghppzs&feature=related) The security-guard segment begins at about minute 9:50. The line aforementioned begins at minute 12:24.